While poaching in KwaZulu-Natal is in fast forward, the prosecutorial system in some areas appears to have gone into reverse. Many of the worrying poaching cases are linked to a magistrate, Deuteronomium Ngcobo, and a defense attorney, Mr Z.W. Ngwenya. This is of concern to police officers who mounted a successful sting operation to arrest an alleged rhino poaching kingpin, Dumisani Gwala, who Ngcobo then released on R10 000 (US$650) bail. The following month four men were arrested inside a private Zululand game reserve and charged with conspiracy to hunt rhino. The case was split between two courthouses. Accused Sipho Hlope and Zakhele Joko Khumalo were represented by advocate Ngwenya before Magistrate Ngcobo at Mtubatuba courthouse. They pleaded guilty and were given the option to pay deferred fines over an extended period. Represented by Ngwenya, Gumbi was granted R500 (US$32) bail by Ngcobo who later acquitted him of all charges, claiming that the police fabricated the story. 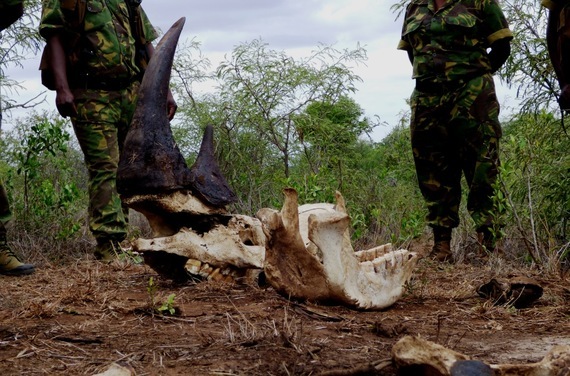 A police spokesman at the time commented that 'poaching syndicates appear to have infiltrated the country's judicial system,' saying the case 'speaks of endemic corruption'. In December 2014 Ngwenya represented Gwala after he was arrested in a complicated sting operation. Dockets of conspiracy to deal in rhino horn, dealing in rhino horn, attempted murder and resisting arrest were opened. Magistrate Ngcobo granted him R10 000 (US$630) bail and released six of his implicated luxury vehicles seized under the Prevention of Organised Crime Act. The South African Police Services immediately obtained a court order to repossess the vehicles, but when the Asset Forfeiture Unit arrived at Gwala's house, he had a five litre container of petrol and threatened to burn the vehicles if the officers didn't back off. The vehicles then 'disappeared' and only one has been recovered. To put the fines and limited bail bonds into persepctive, rhino horn is, per weight, worth more than diamonds or cocaine on the black market in China and Vietnam, fetching up to US$100 000 a kilo. An average of one rhino is killed every nine hours and there are only around 20 000 left in the wild. Yet poaching in certain KwaZulu-Natal courtrooms continues to be treated as a petty crime. Impoverished former poachers I spoke to who had been recruited from rural communities bordering wildlife areas in KwaZulu-Natal told me that when they were given a fine, they had to kill another rhino to pay off their debt to Gwala. They asked that their identities be withheld for fear of their lives. Rhino owners in the region are now deeply concerned about the outcome of Gwala's case. Most of them claim to have been victims of Gwala's alleged poaching syndicate. They say they will be attending Gwala's trial. Trial dates for Gwala's appearance are expected to be announced on March 9 at his next court appearance. The court house has been moved to Ngwelezane in Empangeni where he will be represented by a new defense attorney Mr M. Ntshangase. A new magistrate is being assigned. This time, justice may be done.